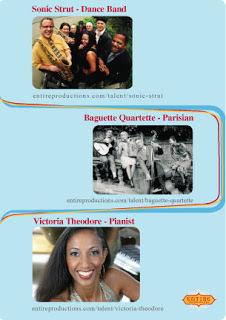 Featured Artists: Sonic Strut, Baguette Quartette, and Victoria Theodore! | Entire Productions, Inc.
We love what we do, we love our clients, and we're in love with our talent and know you will be too! Check them out and book them for your event! The love will go full-circle, and that's good for everyone! Sonic Strut/dance band This band is so much fun, great musicians that perform Motown, R&B as well as select current top 40! The Baguette Quartette/Parisian music Odille and her group are so unique, lovely and beautiful to watch! Odille is from Paris and has the most charming accent ever! Victoria Theodore/pianist Although she's on tour with Stevie Wonder right now, she'll be back soon enough... possibly in time for your cocktail party. We're offering a 10% cash referral up to $250... so send people our way and if they book something, we'll send you some cash. Cool, huh?